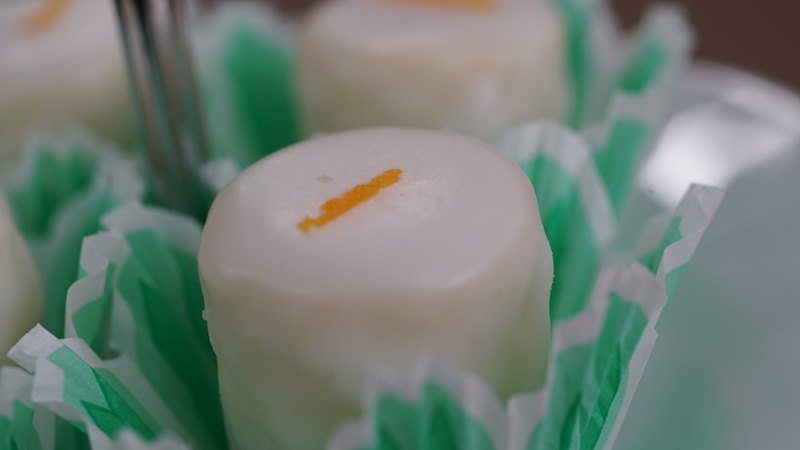 Stephanie Chen loves the flavors of rosemary in a cake and balances it out with some citrus in her petit four recipe. She bakes a Rosemary Olive Oil Cake with Orange Buttercream for the "Patisserie Week" Signature bake challenge. She hopes the judges will enjoy this nice and fragrant cake that features an orange buttercream. Stephanie gets the rosemary flavor into her cake by inserting a rosemary infused olive oil into the batter. Watch the full episode of "Patisserie Week" from The Great American Baking Show Season 2 episode 7. 1. Preheat oven to 350 F / 176 C. Grease 2 x quarter baking sheet on the pan and then line the pans bottom with parchment paper, leaving a few inches of the paper overhand on opposite sides. Also grease the top of the parchment paper. 2. In a stand mixer bowl fitted with a paddle attachment, whisk together almond meal, sugar, all-purpose flour, cake flour, kosher salt and baking powder. 3. In a medium bowl, whisk together eggs, olive oil, whole milk, orange juice, almond extract and vanilla extract. 4. Slowly add the wet mixture into the stand mixer dry ingredients. Stir together and combine. 5. Divide the batter into prepared pans. Smooth out with an offset spatula. Then tap the baking sheets against the table to remove the air pockets. 6. Bake for 15-20 minutes. Give the baking sheets a turn halfway through the baking (after 8 minutes). 1. Beat butter in a stand mixer fitted with a paddle attachment. 2. Sift in powdered sugar, salt and add in zest from the orange. Beat together with butter until smooth. 3. Add in orange juice as needed till desired consistency is met. 1. Cut cooled cakes into thirds. Taking one sheet of layer cake, add a thin layer of filling (orange buttercream) then add the other sheet cake. Continue until the cake is layered with 3 layers. 2. Place parchment paper on top and add another pan on top and place something heavy over it. Put it into the freezer to sandwich together. Freeze for at least 15-20 minutes. Ideally they are in the fridge overnight. 3. Use 1.5" round for the rosemary cake, cut uniform pieces straight down. 4. Cut AT LEAST 15-16 cakes of each shape. 1. Pour 4 cups of sugar into a bowl. Then add powdered sugar, boiling water and corn syrup. Mix together till smooth. Have separate hot water standing by incase consistency isn't thin enough. 2. Add in almond extract. 3. Place on double boiler and mix until it reaches 105 F. Do not increase or it will lose its shine. 4. Dip cakes into fondant using dipping tools.